What I am about to say may sound terribly boastful but it isn’t meant to be. For my twenty-first birthday I was given an Omega watch. It’s very nice; it has an attractive face, the bracelet is well made, and it has one of those continually moving second hands which I just adore. It’s fine when people see me wearing it because they say, ‘Hey James, that’s a nice watch.’ I say, ‘Thanks’, and then we move on. Have a conversation with me and after we have touched upon the watch, we would move onto Wimbledon or how the weather is so lovely and pleasant at the moment. That’s because I hate to be showy. Along with electric gates and curtain pelmets, showing off one’s watch is awfully vulgar. It’s too nouveau and must be avoided at all costs. That’s fine on a ‘one-to-one basis’ but, when I haven’t got my watch on and people happen to ask me about it, I fall into that trap of vulgarity. Saying you just have an Omega is not enough. It’s like saying you drive around in a Ford these days. ‘But what Ford?’ is always the answer. Saying, ‘Oh it’s an Omega Seamaster 300 M Chronometer – the one with the black face, helium escape valve, unidirectional bezel and high-performance, diver-spec rubber seals’ makes you look like a complete prat. So you have to resort to ‘Oh it’s the James Bond watch, the one that Daniel Craig wore in Casino Royale.’ I think I might be sick. I have the initials and the watch, all I need now is the right motor in order to, what would appear to be, a life-long ambition to become a fictional spy who found fame in cheap paperbacks and cheesy films. What started out as a lovely birthday present now has the capacity to turn me into a very sad and deluded person. This brings me onto the Aston Martin DB5 – and, more specifically the James Bond Aston DB5 that is up for auction later this year. 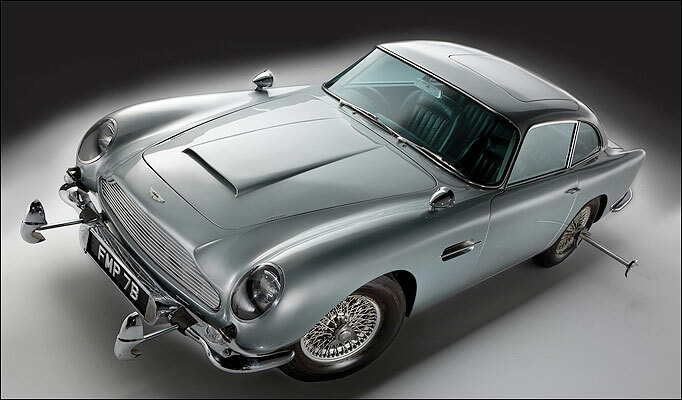 ‘FMP 7B’ (pictured) was one of four DB5s modified by Eon Productions in 1964 for Goldfinger – two were made for filming and the other were modified for promotional purposes – with ‘FMP’ being one of the cars used in the film. It is packed to the gunnels with all of the now clichéd gadgets, and represents the only genuine Bond DB5 due to the other being stolen in the 1990s and broken up for spares. When it goes to auction in October, it is thought to be the most expensive Aston Martin ever sold with an auction estimate of £3.5 million. This, ladies and gentlemen, is the closest you’ll get to touching Sean Connery’s bottom. I – Batchelor, James Batchelor – am of the opinion that the estimate is too cheap and it will fetch far more than that. If you’re the biggest Bond fan, and you’ve got £50 million in the bank, and you have got all the merchandise – one of Honor Blackman’s eyelashes, Bond’s Omega Seamaster 300 M Chronometer…that sort of thing – then this DB5 is the ultimate play-thing. But, I’m afraid that is the very point; it’s a play-thing. No one in their right mind would use it because it’s worth too much, and you just know that you’ll ‘accidently’ press the button to fire oil out of the back just when a police car happens to be behind you. And you also know that someone bald, wearing a pink shirt and driving a Ferrari 355 will challenge you to a race and you’ll lose spectacularly. However, for the rest of us, the decision by Aston Martin to give four cars to the makers of James Bond remains probably the worst decision in the world. Ask me to name my dream car and I would not say the DB5 but the Jaguar E-Type would be the answer. Sure it’s achingly gorgeous and makes a lovely noise but the James Bond association has not only ruined the DB5’s image, but has also made buying a normal DB5 – or any Aston for that matter – far out of the reach for you and I. Drive around in an Aston today and people either think you’re a drunk footballer or, worse, a James Bond wannabe who wears an Omega and eats Weetabix swimming in Martini. Don’t get me wrong, I love Astons but, if you’re thinking of buying one, act very carefully when you say ‘I drive an Aston’. Mr. Bond, you would have done us all a great favour if you had let yourself be castrated by Mr. Goldfinger. Omega owners, for instance, could wear in peace.